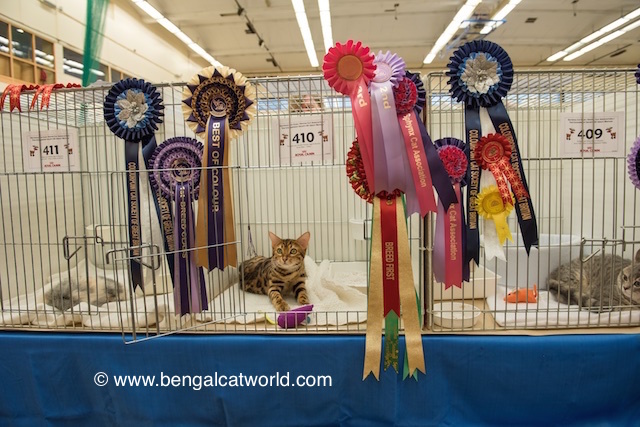 All the news from the cat show! I’m sorry I’m a little late writing my blog today – I have to dictate to my mummy who types for me (my paws are rather large for the keyboard) and she was very rude and decided to go out to the movies earlier this evening with her friend! 😯 So that left me kind of in the lurch! My daddy was here and I managed to get quite a few of my favourite chicken treats from him, but he said he was too busy to help me write my blog, so I’ve had to wait for my mummy to come home. 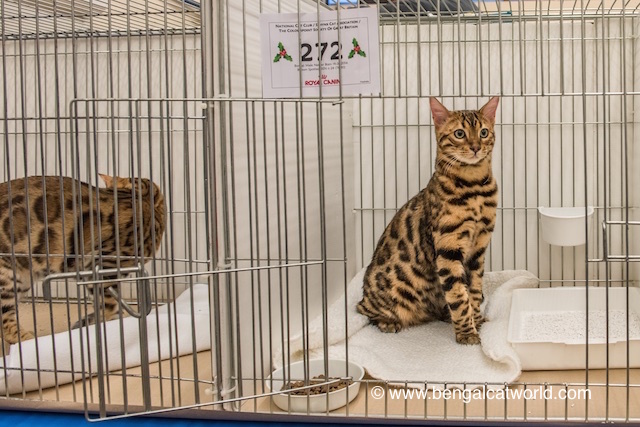 But she’s here now, so we’ll get on with sharing all the news from the cat show yesterday! So, just to explain a little fact – some UK GCCF shows are double or even triple shows. This is where they have more than one show happening at the same time, in the same hall. If your cat is eligible, you’re allowed to enter 2 shows if you wish (you have to pay twice of course 😉 ). They got there nice and early and passed through vetting in with flying colours, then it was over to clean the pens and put inside clean blankets, litter trays, water and food. All that was left then was for Spike and Annie to settle in and have a few final checks to make sure they were still clean and tidy. It was then a waiting game for the judges to make their decisions! It seemed to take forever, but eventually all the results came in. Annie had a good day, though not as good as in some other shows 😆 In the Sphynx show, she came 1st in her main class and also beat the boys to be Best of Breed; she then came 2nd and 3rd in her side classes. 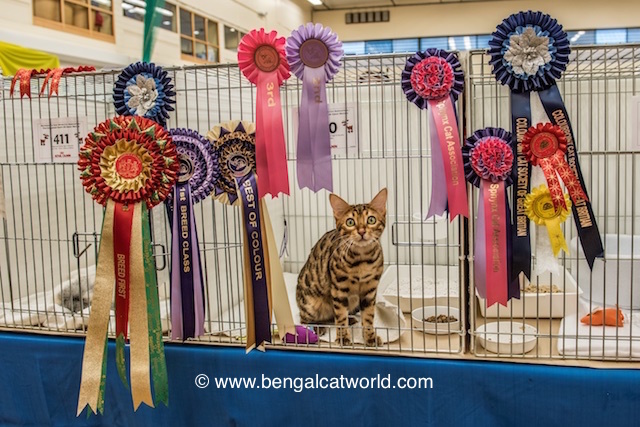 In the National show, she came first but a Bengal boy beat her to Best of Breed, and she came first and second in her side classes. So she had lots of rosettes to show off! Annie was also quite chilled out and was thinking about having a look around the hall! 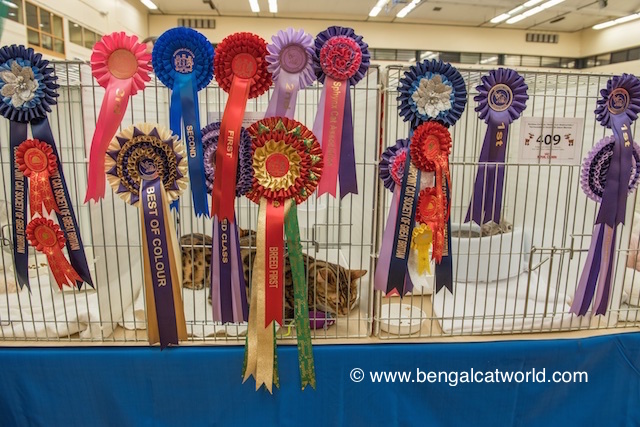 As the show started to draw towards a close, all of Annie’s rosettes had been handed out and put on her pen, and Spike was able to leave his pen and join her. Not that you can see them very well! such a bagful of rosettes, can hardly see the babes thru the screen of ribbons ! Annie did so well in her various shows so big congratulations to her. As for Spike, it must have been very stiff completion for him not to carry off a bunch of firsts ! Very well done indeed to both of them. Spot, do you know if Firtini took any ribbons home wit her ? I’m sure Mum and Dad need congratulations too for presenting the young uns in such prime condition, please tell them I said so. Hope everyone has recovered from such a long journey and a tiring day. Thanks for your great blog and pics Spot. Well done and always love to hear good new like this! I wish you all the luck in the future and keep in touch! 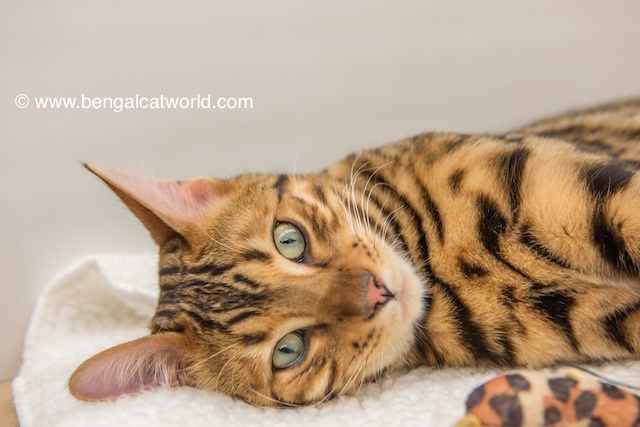 Just come across your blog, great post MEOW!